Fig. 3.32. Determination of residual radial stresses by elastic unloading. 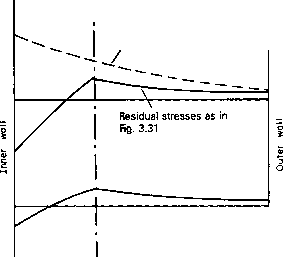 Finally, if the stress distributions due to an elastic internal working pressure Pw are superimposed on the residual stress state then the final working stress state is produced as in Figs. 3.33 and 3.34. Elastic looding stresses under working pressure P.
Fig. 3.33. Evaluation of hoop working stresses. Fig. 3.34. 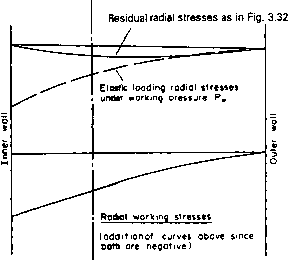 Evaluation of radial working stresses. i.e. 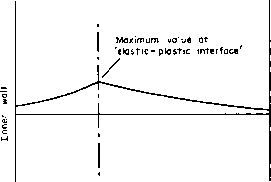 aH — or = (Ty/n also indicates the elastic/plastic interface as now more critical than the internal bore - see Fig. 3.35. Fig. 3.35. Distribution of maximum shear stress = j (ay — or) by combination of Figs. 3.33 and 3.34. Depending on the end conditions which can be assumed for the cylinder during both the autofrettage process and its normal working condition a further complication can arise since the axial stresses oz which are produced can affect the application of the Tresca criterion. Strictly, Tresca requires the use of the greatest difference in the principal stresses which, if oz is zero, = oH — oy. If, however, az has a value it must be used in conjunction with oH and oy to produce the greatest difference. and axial stresses under elastic conditions being given by eqn. (10.7)$ with P2 = 0 and P\ — Pa or Pw as required. It will be shown in Chapter 4 that the centrifugal forces which act on rotating discs produce two-dimensional tensile stress systems. At any given radius the hoop or circumferential stress is always greater than, or equal to, the radial stress, the maximum values occurring at the inside radius. It follows, therefore, that yielding will first occur at the inside surface when the speed of rotation has increased sufficiently to make the circumferential stress equal to the tensile yield stress. With further increase of speed, plastic penetration will gradually proceed towards the centre of the disc and eventually complete plastic collapse will occur. t G.J. Franklin and J.L.M. 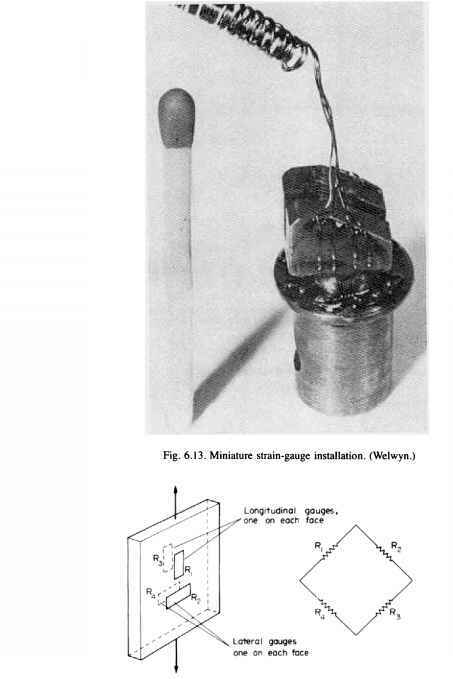 Morrison, Autofrettage of cylinders: reduction of pressure/external expansion curves and calculation of residual stresses. Proc. J. Mech. E. 174 (35) 1960.
i E.J. Hearn, Mechanics of Materials I, Butterworth-Heinemann, 1997. Now since the stress cannot be infinite at the centre where r = 0, then A must be zero.